Some artists paint; some model in clay. A few provocateurs, however, use the animal kingdom as their medium—and for some of them, the last few of months have been rough indeed. Back in September, The Guggenheim had to pull several artworks from a show of contemporary Chinese artists after complaints from animal rights groups. Among the offending pieces: A video of dogs harnessed to treadmills who run until exhaustion; and a tabletop tableaux in which hundreds of insects and reptiles fight for survival under a brightly lit dome. 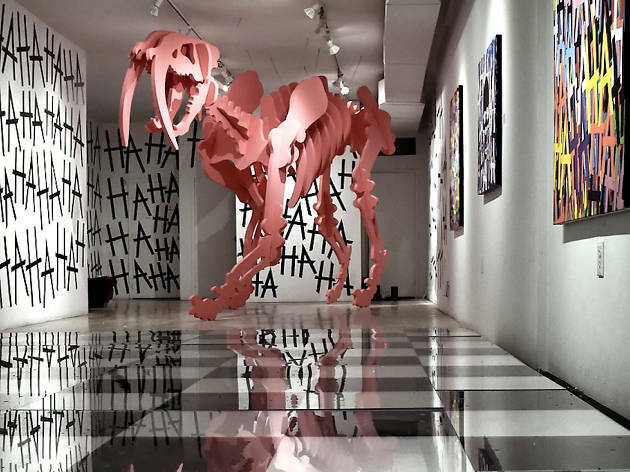 Now, Castle Fitzjohns Gallery on the Lower East Side is feeling the heat from PETA, thanks to an installation by Joseph Grazi. The piece consists of transparent Plexiglas floor covering a habitat for live mice originally bred as food for snakes and other animals who love meeces to pieces. 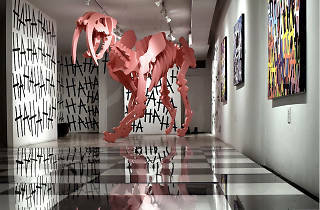 The work is part of Grazi’s latest exhibition, “Prehysteria,” which, besides mice, includes a nine-foot, skeletal model of a saber-tooth tiger. According to a gallery statement, the show sets out to “alleviate the most ancient fears through…a better understanding of our place in the natural world.” The gallery goes on to state that the mice “are fed, watered and are in comfortable modular environments with nesting materials and a place to sleep.” According to PETA, though, the mice are being subjected to a stressful environment. For the moment, the gallery doesn’t seem to be following the Guggenheim’s lead by pulling the piece from Grazi’s show. There's art and then there's the exploitation of animals. This, obviously, falls into the second category. There is nothing creative or progressive about this exhibit. All it does is expose the artist's lack of compassion. Art is subjective and I'm as open-minded as the next guy, but cruelty to animals doesn't fall under any definition. This is just twisted and sick, no other way to spin it. Using animals isn't creative or provocative--it's a cheap gimmick for attention. By all means, make art that challenges, inspires thought and debate, and offers a new perspective, but please, leave animals out of it.